A Letter to our Senators about Gaza--Action Needed! The Alliance for Water Justice in Palestine delivered the letter below, signed by several Massachusetts groups, to the offices of Senators Markey and Warren, both of whom had signed onto the May 11th letter to Secretary of State Pompeo initiated by Bernie Sanders. If you don't live in Massachusetts, feel free to use information from this letter in outreach to your representatives. If you do live in MA, please call Senator Warren (617 565 3170) and Senator Markey (617 565 8519). Thank them for speaking out about the killing of unarmed demonstrators in Gaza and urge them to push for an end to the 11 year closure of the Gaza Strip. Tell them that this is essential if a looming humanitarian catastrophe is to be averted. The undersigned Massachusetts organizations want to express our gratitude to you for signing onto the May 11, 2018 letter to Secretary of State Pompeo urging the administration to do what it can to alleviate the ongoing humanitarian crisis in the Gaza Strip, including restoring its funding cuts to UNRWA, and working to ease restrictions associated with Israel’s 11-year-long siege. As the letter points out, unless immediate action is taken to address the dire water situation, electricity shortage and collapsing economy, the Gaza Strip may soon be ‘unlivable’ as UN reports have long warned. We take issue with this provision. Although such an initiative might bring a measure of economic relief, enabling Israel to reconfigure the cage in which it has confined Gazans is not what is needed from the US. Instead, our country should be putting its weight behind the international consensus – long thwarted by the US through its UN vetoes - that both the 11-year-long closure of the Gaza Strip and Israel’s 50-year-long military occupation must be brought to an end and the rights of Palestinians under international law must be asserted and fully protected. Currently, Israel is operating with total impunity against unarmed protestors demonstrating for freedom from their open-air prison, and for a recognition of their human rights, including the rights of refugees who make up 70 percent of Gaza’s population. The statistics are shocking. Without a single Israeli being killed or even injured, more than 100 Palestinians have been killed, including many children and two journalists wearing vests clearly marked ‘PRESS.’ Hundreds of journalists, hundreds of women and more than 700 children are among the 12,000 who have been wounded, many shot – according to Amnesty International – with US manufactured Remington M24s. Amnesty reports that Israeli snipers are also using locally-made Tavor rifles with a military combat load of 5.56mm ammunition designed to fragment and pulverize bone and flesh, causing large exit wounds and often requiring amputations. The fact that Israeli snipers are regarding nonviolent protesters as dehumanized ‘targets’ that can be killed at will or permanently disabled with the squeeze of a trigger finger should be met with outrage by the US Congress, which in 2016 approved giving Israel $38 billion in military aid over a 10-year period. A range of US and international human rights groups have denounced the Gazan killings as crimes against humanity. Shortly after the US on March 31 blocked a Security Council resolution calling for an investigation into the killings, Human Rights Watch termed them “unlawful” and urged the International Criminal Court to open a formal investigation into serious international crimes in Palestine. (On May 8, Israel revoked the work permit of Omer Shakir, the director of Human Rights Watch, and gave him 14 days to leave the country). We support the call by Amnesty International for an arms embargo on Israel. But we understand that the provision of the Foreign Assistance known as the ‘Leahy Law’ (section 620M) – which limits the cut off of military aid for human rights violations to individuals and military units – can not as currently framed be made the vehicle for moving towards a nation-wide arms embargo. However, it can be deployed to demand accountability for how Israeli military units have been using lethal repression against unarmed Palestinian protest activity. This would require an independent investigation into the Gaza killings. We ask you to continue to show sorely needed leadership on this issue by working with Senator Leahy, and your other colleagues who signed the May 11th letter, to invoke the Leahy provision in order to demonstrate that Israel is not beyond the reach of US domestic and international law. By taking a stand to hold Israel accountable you will not just be upholding the rule of law. You will also be giving voice to increasing numbers of your constituents. As you may be aware, public opinion on the question of Israel/Palestine is changing both generationally and within the political parties. A January 2018 Pew Research Center poll found that 70% of Republicans say they sympathize more with Israel than Palestinians, compared with only 27% of Democrats. We hope that through your leadership, growing numbers of your colleagues will be encouraged and emboldened to reflect this shifting public opinion. 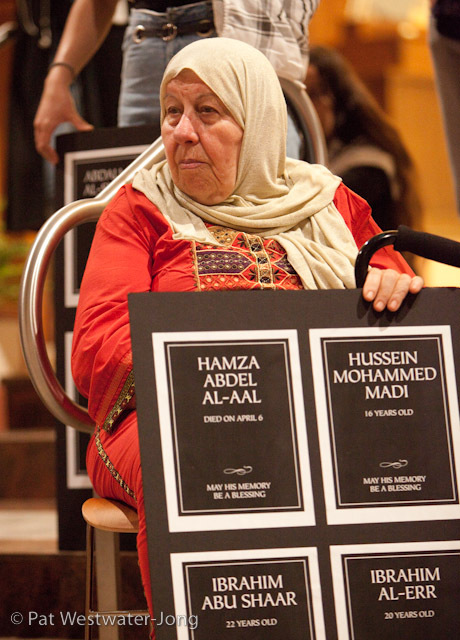 Woman hols signs with names of Palestinians killed by Israeli forces at Boston event "Remembering and Resisting: 70 Years of Ongoing Ethnic Cleansing in Palestine."